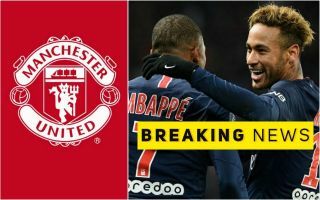 Manchester United are reportedly already in advanced transfer talks over signing Paris Saint-Germain superstar Neymar. In an astonishing report from Spanish outlet Diario Gol, it’s claimed the Red Devils have negotiated detailed aspects of Neymar’s potential transfer with his father and representative. The piece explains that United could have to pay as much as €200million in terms of a transfer fee for the Brazil international, plus an extra payment of €30m to his father. This would be a simply incredible signing for MUFC if they could pull it off, with Neymar undoubtedly one of the finest footballers on the planet, and one of the biggest personal brands in sport as a whole. The 27-year-old seems ideal to be the face of their new project, as Diario Gol explains, and they add that United are ‘serious’ about this ambitious deal, entering into more advanced talks over the player than Real Madrid. This move would undoubtedly rock world football, and it would be great for neutrals to see a big name like Neymar in the Premier League. With Man Utd looking back to their best under Ole Gunnar Solskjaer, this potential deal really would be a game-changer for the club after a difficult few years as they’ve suffered a post-Sir Alex Ferguson lull. Neymar, however, is good enough to help them close the gap on neighbours Manchester City and this emerging Liverpool side.